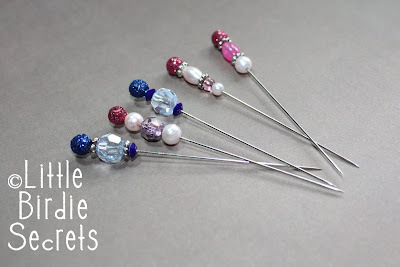 I love the look of hat pins in cards and other paper crafts. Imagine how excited I was to see this post about how easy they are make. I had all the supplies on hand so I thought I would whip up a few. Want to make some too? 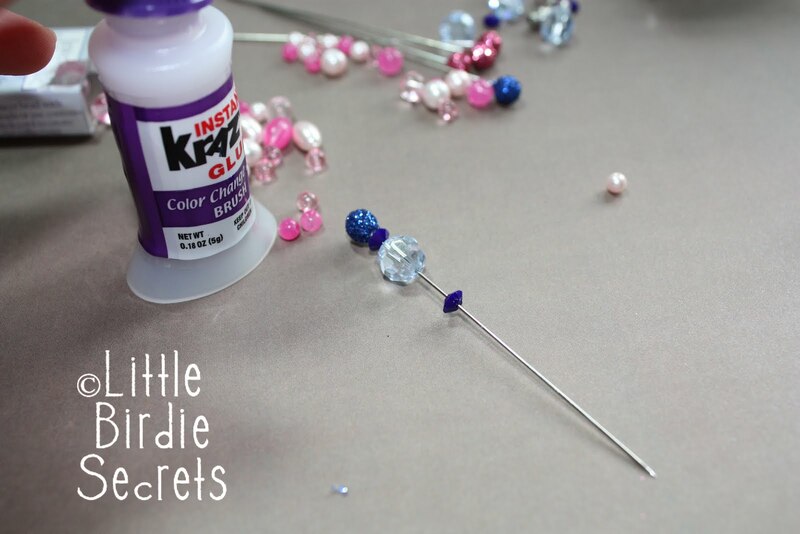 Grab some corsage pins, beads, glue and glitter (optional). Here's how I did it. I do love the look of the white pearl, but I wanted to see if I could try something different. So, I used a paintbrush and painted the corsage pins with glue. I then gently rolled the pin head in the glitter and let them thoroughly dry. Next, I scrounged up some beads from a broken necklace and such and started adding them to my pins. 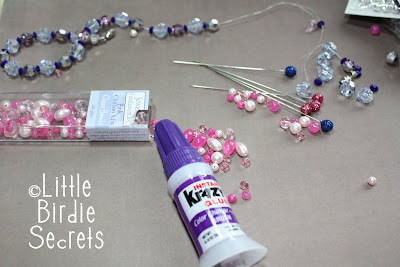 When you get to your very last bead you want to add to your pin, take out the glue and glue the area that bead will be. 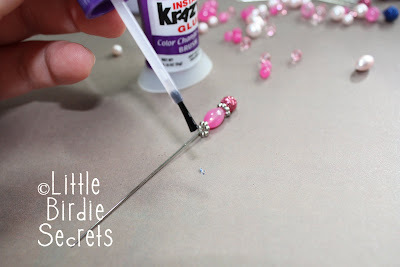 I used this Krazy Glue because it had a brush for easy application and it dries clear. Make sure whatever glue you use dries clear! Then you add your last bead and hold it in place for a few seconds and it should stick. Now you have some fancy hat pins or scrapbooking stick pins to use in your crafting adventures. If beads are not your thing, go ahead and glue on buttons. You will probably need to stay away from corsage pins since they usually have the large pearl tops. 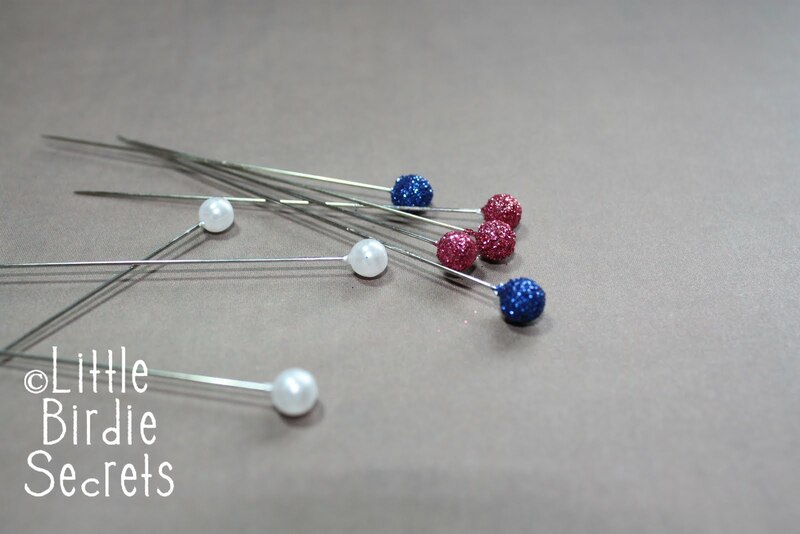 You can either buy stick pins or make your own. If you are making your own; I would buy a thicker gauged wire and cut it the length I needed and then glue the button on to one end for a pin head. You won't have the sharp tip so you can use another pin to punch the hole where you need it and then just slid your wire in. Another cute option is to make sweet polymer clay pin heads in the shape of hearts, strawberries, cupcakes, or whatever suits your fancy at the moment. I LOVE them. Now I can't wait to buy some corsage pins to make my own. Thanx for sharing. I love this idea and have wanted to male some for quite awhile. I have corsage pins..but O would like the pins to be even longer...do you have any idea where to buy stickpins.. or longer pins?? No, I am not sure where to get them. I tried looking around and found it really hard to find them. I did notice that one pack of my corsage pins is a little longer than the other so maybe shop around and see if you can find the longer corsage pins. Sorry I can't be more helpful. Those are really cute, but I'm a little confused about what they're used for...? Thanks. Hi Noalls! They are used in cards and scrapbooking as an embellishment. I will see if I can get some samples to show you. OOHHH, so cute. I'm going to have to do something like this for my daughters craft room. LOve it. These are so pretty! Thanks so much for the how-to, I'll be linking. I know my local bead shop carries them, maybe CC can try there? You could also use head pins, they have a tip on top to stop things coming off, but they're not sharp. 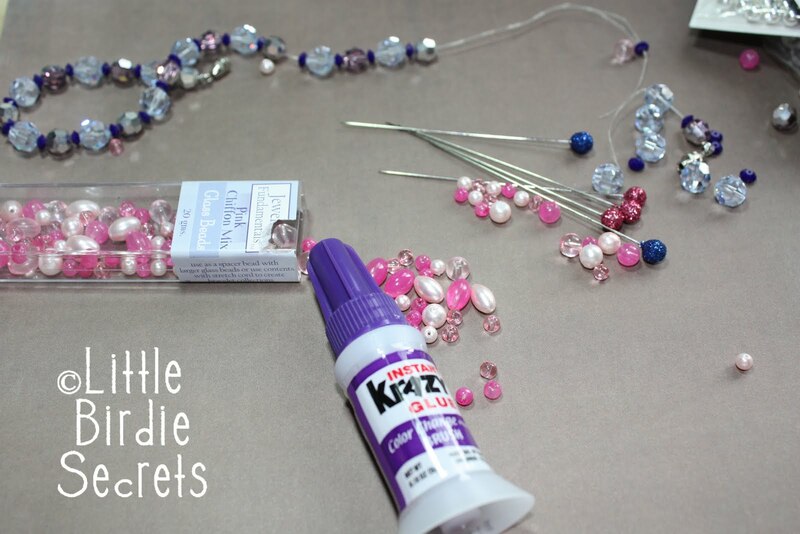 If your glue won't hold the beads on, try using a crimp, they're super cheap, you just pinch them with pliers to shut them. Very clever! And oh, so pretty! tree craft - great "green" inspriation! photoshop elements for mother's day anyone?